Before arriving in Italy, like any eager student who has never once stepped foot outside of the United States, I had brainstormed what exactly I wanted to get out of my study abroad experience: what I wanted to learn, what I wanted to see, what I wanted to eat! I found myself spending more time adding to this never ending list of potential adventures than I did packing for my three week journey (which is saying a lot, considering anybody who knows me can vouch for how seriously I take my packing!) While I knew my options for adventure were endless, I wasn’t ignorant to the time constraints that could limit my three week stay. Yet, it wasn’t even until I finally did arrive in Italy and completely fell in love with it, did I truly begin to feel the pressure of the ticking time clock. It was only about one week into my journey and I had already begun to regret having only chose to stay for three weeks, considering there was so much to see and do simply in the beautiful city of Florence, my host city, not to mention the myriad of other places I wanted to travel to and visit like Rome and Venice, for instance. Nonetheless, I calmly referred back to my handy dandy list, with a pretty good inkling and some faith that one day, sooner or later, I would find myself back in Italy again, and highlighted my top priorities! 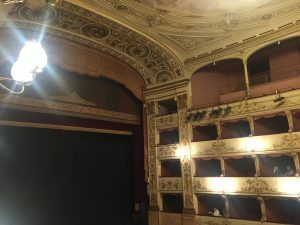 Naturally, climbing the Duomo, visiting the Uffizi Gallery, and touring the Medici Chapel made it on the list, but in addition to seeing all of these historically relevant landmarks, I knew I couldn’t leave Italy without seeing some theatre! After all, I am a theatre major! Over the past thirteen years of my being an avid member of the theatrical, performing arts, and entertainment communities, I have learned a great deal about the evolving conventions, practices, and traditions that define American theatre and performance art. 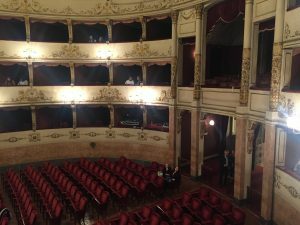 Recently, my collegiate studies have also introduced me to those conventions specific of theatre and performance in other cultures and countries, including Italy, and therefore was stoked to experience Italian theatre first hand! 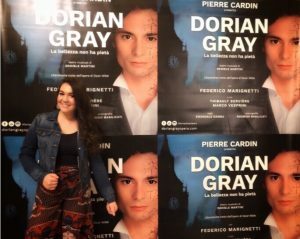 Having only very vaguely heard of it before, I learned, after some research, that Dorian Gray is an opera based off of Oscar Wilde’s 1891 novel, The Picture of Dorian Gray. Like the story, the opera focuses around the title character and deals with themes of vanity and morality. Pierre Cardin’s production showcased a small but mighty cast of two performers, accompanied by convoluted and abstract electronic projections that grounded the piece and almost become characters of their own, adding directly to the narrative of the story. The barren, black, moveable set served as the perfect canvas for these projections. I was pleased to notice the seamless ways in which this production modernized and made relevant the themes of Victorian times for a more contemporary audience, especially within its use of the previously mentioned projections. 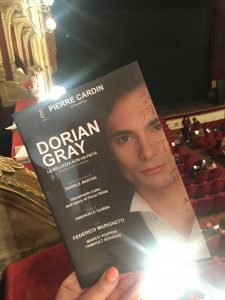 Federico Marignetti’s (Dorian Gray) crystal clear tenor vocals and Thibault Servière’s (Dorian’s Shadow), blisful embodiment of dance technique and performance, were icing on top of the cake. Upon walking into the theatre, with its shimmering chandeliers and tall elegant staircase leading to the stage, I knew I was about to experience something I could never forget, and I certainly was proven correct! 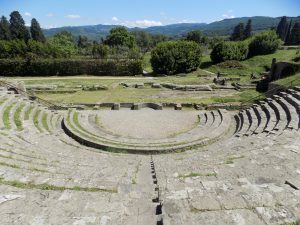 My experience with Italian theatre continued two days later with my field learning excursion in Fiesole, Italy for my Intermediate Italian language class at Florence University of the Arts. 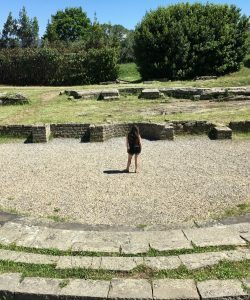 In Fiesole, I toured the Museo di Fiesole, where I got the opportunity to visit a traditional Roman Theater! Shamelessly, the theatre nerd inside of me totally geeked out when I got to stand centerstage and take in all of its beauty and character. I had previously learned about the history, components, and structure of traditional outdoor Roman theaters in many of my classes and was proud to be able to put my knowledge to use and point them each out, well, that is what remained of them. Because these theaters date back to as early at the fourth century B.C., much of the concrete structures have endured a great deal of weathering and erosion leaving behind scattered bits and pieces of the original structure. In the case of the theater I visited, all that remained was the auditorium, or audience if you will, what appeared to be parts of the wings and proscenium, and portions of the actual stage, although I could truly differentiate between was the open, semi-circle downstage playing area that usually housed the chorus members of the play, from the upstage playing area that often served as playing space for the main narrative of the play. Unfortunately, the majority of the upstage structure had been withered away entirely. While I cherish each and every one of my experiences in Italy, I am honored to have been given the opportunity to bring with me and further strengthen my passion for performance and theatre while experiencing life abroad! Brielle is a summer 2018 SAI Florence student from Muhlenberg College.